LEAVES: Needle-like, blue-green, evergreen. Mature Size: 4"-6" tall & Spread: 6 to 8 feet. Spacing 4-6 feet apart. Ideal for mass plantings and lining out stock. Growth is of moderate- rapid speed with 0.5 - 1.5' per year. The lowest growing of all the ornamental juniper ground covers. uniperus horizontalis 'Wiltonii' COMMON: Blue Rug Juniper LEAVES: Needle-like, blue-green, evergreen SIZE: 4"-6" tall Spread: 6 to 8 feet Growth is of moderate- rapid speed with 0.5 - 1.5' per year. 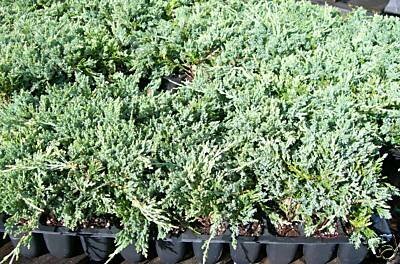 HABIT: Small shrub or groundcover, low tailing habit SOILS: Tolerates poor soils, likes sandy soils, will grow near sea shore, does not like excessive moisture, needs well drained soils LIGHTING: Full sun USES: The lowest growing of all the ornamental juniper ground covers. It creates a dense carpet-like mat along the ground. It is an excellent plant for slopes and banks to help stop erosion. In addition to their use as groundcovers the juniper shrubs and their relatives make excellent specimens for rock gardens. MAINTENANCE: Low-maintenance HARDINESS: Zone 4 to 9. Picture is for example only. This is for 1 plant each.